Four-lobed seals feature a geometry that provides twice the number of sealing surfaces compared to standard O-Rings. Doubling the number of sealing surfaces allows a four-lobed seal to perform at lower pressures and/or with less squeeze than a standard O-Ring. The four-lobed configuration also creates a more stable seal that reduces the likelihood of spiral twisting in reciprocating applications. This is because rather than relying solely on squeeze to achieve a seal, four-lobed seals employ both squeeze and deflection to create the seal. Four-lobed seals can be used in standard O-Ring, Quad Rings grooves or in deeper four-lobed seals with specific grooves, resulting in less friction and longer seal life. 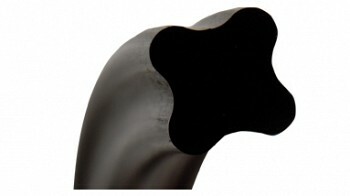 Four-lobed seal grooves can also be narrower than O-Ring grooves, as spiral failure is less of an issue. For four-lobed seal groove recommendations, please go to our Groove Design Chart for Four-Lobed Seals. RT Dygert stocks many different AS568 sized four-lobed in either 70 durometer nitrile or 75 durometer Viton™.